Argenta-Oreana High School played the 2016 season in memory of long-time volunteer coach Duane Hupp, who passed away suddenly during a vacation in July. The Bombers and head coach Chad Eisenmenger completed the regular-season 8-1 after winning just three combined games the previous two seasons, and had high hopes for the Class 1A Playoffs before falling 32-30 to Warrensburg-Latham in the First Round. The Bomber coaches and players all wore the initials "DH" in Hupp's honor on their helmets and polo shirts. 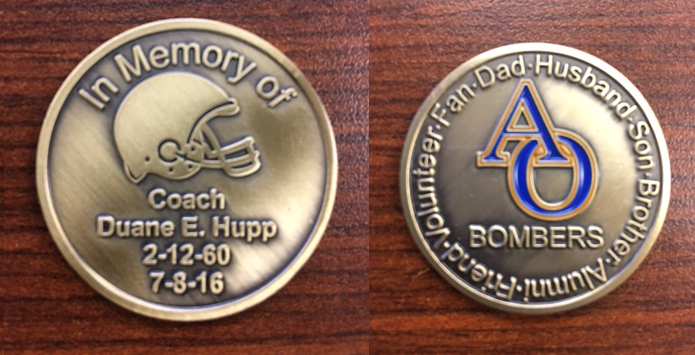 In addition, a commemorative coin was created in honor of Coach Hupp, as his wife and two children (above) served as the team's honorary captains in Week 2. "Its amazing how the players, coaches and community have rallied and dedicated this season in his memory," said Eisenmenger.